Easter Island has a violent volcanic history and its landmass consists (mainly) of three long-extinct volcanoes, Poike, Rano Kau and Terevaka. Additional landforms spread across the island included much-smaller volcanic cones including Rano Raraku, Puna Pau and a series of caves. A few small islands (islets) are found off of the southwestern coast, with Motu Nui being the largest. Those islets are actually the summit (or peaks) of a large volcanic mountain rising over 2,000 m (1.2 mi) from the sea bed. On this all but treeless island there are no permanent lakes, rivers or streams. 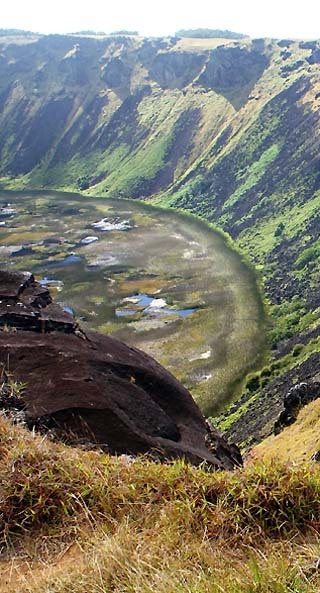 If you note our photo to the right, there are a few temporary pools of water at the bottom of the Rano Kau Volcano crater.